Article: How Did You Do That? Linneah and Simone Zink tuck for a downhill. When asked to write an article about how I got my kids started in Nordic skiing before Alpine skiing, the first thought that popped into my head was, “I didn’t have a choice.” Don’t get me wrong. We have seven Alpine areas within an hour from our home. Initially, it was a financial and physically selfish decision. However, the rewards it has given to our family unity have definitely been profitable in the long run. Both my husband and I grew up downhill skiing, but gravitated away from it as ticket prices and crowds increased. We began cross-country skiing long before deciding to have kids. For me, it was a great way to stay in shape and a fun way to enjoy the longer winters of Colorado. When I became pregnant, it was a wonderful, non-impact activity that I could do up until the day I delivered. One week after our daughter was born, I was back gliding on the trails with her nestled in the front pack. As she got older (and heavier), I put her in a pull-along sled loaded up with toys, books, and snacks. It wasn’t always easy, or without resistance. However, if I wanted a work-out, that was the only way it was going to happen. 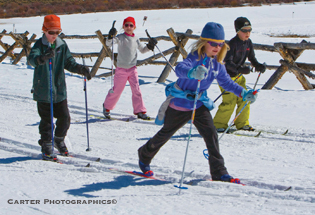 Kid’s Nordic Ski Program at Devil’s Thumb Ranch. 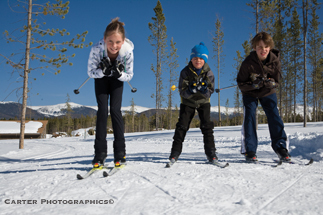 Nordic centers in Grand County don’t offer daycare programs, or daily little kid programs like their alpine counterparts. 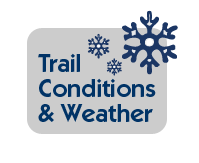 What they do offer is rental sleds, groomed trails, and an affordable way to enjoy the wintertime, while doing it with the family. Once the kids were able to stand comfortably on skis, my husband rigged a bungee cord-like system attaching the child to the parent with some room and “give” in between. The cool thing about this set up is it allowed us to ski with our kids without much extra work involved. At the same time, the kids could mimic our movements and learn technique all the while not worrying about always having to catch up, or losing sight of us. When they got tired, they could just rest in the tracks while we pulled. When going downhill, we could either ski beside them, behind them, or detach and let them rip! As any overprotective mom would agree, it’s a much safer environment to teach them how to go downhill than at alpine areas. You are not fighting for real estate amongst hundreds of other skiers that are ten times bigger than your precious little ones. In retrospect, my husband and I are glad we chose the Nordic route. We feel we’ve exposed them to a sport that will allow them to embrace wintertime with us, throughout a lifetime – not to mention, at a fraction of the cost of other activities! Try it, they’ll thank you for it … someday!